(3) Thereupon the mighty Lord departed, he whose grace is faultless and who was worshiped by the most exalted Asura as the Almighty One praised by all rulers of mankind. (4) The Daitya, who thus had obtained his desired boon and had acquired a body with a golden luster, constantly thinking about the brother killed by the Lord, maintained a feeling of hatred towards Him. (5-7) Conquering the three worlds in all directions, He, the greatest Asura, brought the masters of all places under his control: god, demon and man; the kings, the musicians of heaven and the birds [the Garudas]; the serpents, the perfected souls and the bards; the scientists, the seers and the leading manes; the fathers of mankind, the treasure keepers and the wild men; the goblins, the evil spirits and the ghosts. As the conqueror of the world, he usurped the power of rule of all authorities, everywhere. (8) Situated in the pleasure garden of the gods with the riches of all opulence, he thus resided in the highest world. Living in the palace of the king of heaven as created by Vis'vakarmâ, the great Asura architect, he, in control of all the wealth of the entire universe, dominated the three worlds from that abode of Lakshmî. (9-12) The steps there were made of coral, the floors of emerald, the walls of crystal and the rows of pillars were made of vaidûrya [cat's eye] stone. One also found there the most wonderful canopies and seats bedecked with rubies and bedding with pearls on its borders that was as white as the foam of milk. In the quarters adorned with jewels and gems, in which they saw their beautiful faces and teeth reflected, celestial ladies left and right made sweet sounds with their tinkling ankle bells. In that royal residence ruling most severely with the greatest might and mind, the dictator, controlling everyone, enjoyed it to be worshiped by the tormented, God-fearing entourage at his feet. (13) Oh best one, he, the embodiment of all austerity, yoga, strength and good sense, who by anyone but the three principal deities, was honored with all glory with presentations from the hands of all important men, was thus engaged, while being intoxicated by strong scented wines that made his eyes roll red as copper. (14) With all his power occupying the seat of Indra, he was glorified by Vis'vâvasu, Tumburu [the greatest Gandharvas] and by me, oh son of Pându. Again and again all the singers and girls of heaven, the perfected souls, the saints and those who base themselves on knowledge offered their prayers to him. (15) Thus with gifts in abundance being worshiped by all classes and age groups, he, in the exercise of his power, reserved every share of the oblations for himself alone. (16) Mother earth yielded, as the cow of plenty, under his rule on all her seven continents spontaneously crops in a great abundance, while all the wonders of the universe could be observed in the sky. (17) The seas and oceans of salt and sweet water, wine, ghee, cane juice, yogurt and milk, as also their wives the rivers, carried all kinds of precious stones in their waves. (18) The valleys between the mountains and hills were his pleasure grounds that offered all the wealth of plant and tree throughout all the seasons. He alone stood for all the different qualities of all the ruling gods of nature. (19) Despite having conquered all directions as the one and only ruler, with the right to exhaustingly enjoy all thinkable pleasures, he was not at peace with it, for he had lost the control over his senses. (20) Being cursed by the brahmins [the Kumâras] he was intoxicated by great pride over the opulence he had acquired, so that a long period passed of living in offense with the scriptures [see also B.G. 16: 23-24]. (21) Because of his painful rebukes all the worlds were disturbed and for their leaders there was no safe place to be found. Therefore they approached the Infallible One to seek shelter [compare B.G. 5: 29]. (22-23) They prayed thereto: 'We offer our obeisances in the direction where the Supersoul of Hari, the Supreme Lord, is found and from where the peaceful and pure souls of the renounced order never return.' With their minds under control, being wakeful and feeding on air only, they thus steadied and purified their intelligence in the worship of the Master of the Senses. Third revised edition, loaded January 18, 2019. S'rî Nârada said: 'Thus being solicited Lord Brahmâ, who sees everywhere, pleased about Hiranyakas'ipu's austerities then granted him the benedictions that are so hard to obtain. Thereupon the mighty Lord departed, he whose grace is faultless and who was worshiped by the most exalted Asura as the Almighty One praised by all rulers of mankind. The Daitya, who thus had obtained his desired boon and had acquired a body with a golden luster, constantly thinking about the brother killed by the Lord, maintained a feeling of hatred towards Him. Conquering the three worlds in all directions, He, the greatest Asura, brought the masters of all places under his control: god, demon and man; the kings, the musicians of heaven and the birds [the Garudas]; the serpents, the perfected souls and the bards; the scientists, the seers and the leading manes; the fathers of mankind, the treasure keepers and the wild men; the goblins, the evil spirits and the ghosts. As the conqueror of the world, he usurped the power of rule of all authorities, everywhere. Situated in the pleasure garden of the gods with the riches of all opulence, he thus resided in the highest world. Living in the palace of the king of heaven as created by Vis'vakarmâ, the great Asura architect, he, in control of all the wealth of the entire universe, dominated the three worlds from that abode of Lakshmî. The steps there were made of coral, the floors of emerald, the walls of crystal and the rows of pillars were made of vaidûrya [cat's eye] stone. One also found there the most wonderful canopies and seats bedecked with rubies and bedding with pearls on its borders that was as white as the foam of milk. In the quarters adorned with jewels and gems, in which they saw their beautiful faces and teeth reflected, celestial ladies left and right made sweet sounds with their tinkling ankle bells. In that royal residence ruling most severely with the greatest might and mind, the dictator, controlling everyone, enjoyed it to be worshiped by the tormented, God-fearing entourage at his feet. Oh best one, he, the embodiment of all austerity, yoga, strength and good sense, who by anyone but the three principal deities, was honored with all glory with presentations from the hands of all important men, was thus engaged, while being intoxicated by strong scented wines that made his eyes roll red as copper. With all his power occupying the seat of Indra, he was glorified by Vis'vâvasu, Tumburu [the greatest Gandharvas] and by me, oh son of Pându. Again and again all the singers and girls of heaven, the perfected souls, the saints and those who base themselves on knowledge offered their prayers to him. Thus with gifts in abundance being worshiped by all classes and age groups, he, in the exercise of his power, reserved every share of the oblations for himself alone. Mother earth yielded, as the cow of plenty, under his rule on all her seven continents spontaneously crops in a great abundance, while all the wonders of the universe could be observed in the sky. The seas and oceans of salt and sweet water, wine, ghee, cane juice, yogurt and milk, as also their wives the rivers, carried all kinds of precious stones in their waves. The valleys between the mountains and hills were his pleasure grounds that offered all the wealth of plant and tree throughout all the seasons. He alone stood for all the different qualities of all the ruling gods of nature. Despite having conquered all directions as the one and only ruler, with the right to exhaustingly enjoy all thinkable pleasures, he was not at peace with it, for he had lost the control over his senses. Being cursed by the brahmins [the Kumâras] he was intoxicated by great pride over the opulence he had acquired, so that a long period passed of living in offense with the scriptures [see also B.G. 16: 23-24]. Because of his painful rebukes all the worlds were disturbed and for their leaders there was no safe place to be found. Therefore they approached the Infallible One to seek shelter [compare B.G. 5: 29]. They prayed thereto: 'We offer our obeisances in the direction where the Supersoul of Hari, the Supreme Lord, is found and from where the peaceful and pure souls of the renounced order never return.' With their minds under control, being wakeful and feeding on air only, they thus steadied and purified their intelligence in the worship of the Master of the Senses. 'Do not fear, oh best souls of learning, I wish you all the best. From having My vision, the living beings may attain all good fortune. The nefarious activities of this great demon are known to Me and I shall put them to an end. Just wait and see. When one is hostile towards the gods, the Vedas, the cows, the brahmins, the saints, the dharma and towards Me, one will soon perish. S'rî Nârada said: 'After thus having been addressed by the spiritual master of all living beings, the God-conscious souls offered Him their obeisances and returned to their places. Being relieved of all their anxieties they considered the demon as good as dead [2.3: 10]. The Daitya king fathered four most qualified sons of whom the one named Prahlâda was the best, being endowed with all the qualities of a great devotee [see 5.18: 12]. He, as a good brahmin being of full control over the senses and the mind, was firmly established in the Absolute Truth and was, alike the Supersoul, the beloved, best friend of all living beings. He sat down at the feet of the great souls like a servant, like a father he took care of the poor, he was like a brother to his equals and always kind to the spiritual masters whom he esteemed as the Supreme Controller Himself. He was of education, purpose, beauty, nobility and completely free from arrogance and impudence [compare B.G. 12: 13-19 and B.G. 18: 42]. Even though he was born from an Asura, he was not of a demoniac nature. In the midst of danger he was of an unperturbed consciousness and he had no desire whatsoever to talk about, or be concerned with, temporary matters. Material qualities he considered insubstantial and by controlling his senses, life air, body and mind he quieted his lusts. His qualities are, like those of the Supreme Lord, our Controller, unabatedly defended by the scholars to this very day, oh King. In gatherings of saintly people, the enemies [of the demons] discuss these characteristics, using him as an example. When even the wise and learned souls do this, oh King, then why should you, or anyone else, not do that also? One runs out of words when one tries to enumerate the countless qualities of him who owed his greatness to his natural attraction for Vâsudeva, the Supreme Personality of Godhead. As a small boy he, in his full absorption in the attraction of Krishna, refrained from playing and seemed to be absentminded, having no understanding for worldly matters. As he sat and walked, ate and lay down, drank and talked he, embraced by Govinda, was impervious to all of it. Sometimes worrying about [not being in] Vaikunthha he cried, sometimes he laughed about a twist of mind and sometimes he chanted aloud in great jubilation thinking of Him. Sometimes he, being overwhelmed, loudly exclaimed [His name], sometimes he danced without shame and sometimes he, lost in thoughts about Him and projecting himself into His position, imitated Him. Then again he, with his hair standing on end and with tears in his half-closed eyes, fell completely silent, rapt with joy in being caught in the loving association of His transcendental bliss. By his constant service at the lotus feet that are glorified in the hymns and by the evolution of his selfless association, he attained the highest ecstasy. From the spiritual soul he that way continually brought peace to all [around him] who lacked in spirit and association. S'rî Yudhishthhira said: 'Oh devarishi sworn to vows, we would like to know from you the following: why did the father make his own pure and exalted son suffer? Sons going against the will of their fathers are lovingly reprimanded. But for teaching them a lesson they cannot be punished like an enemy, is it not? 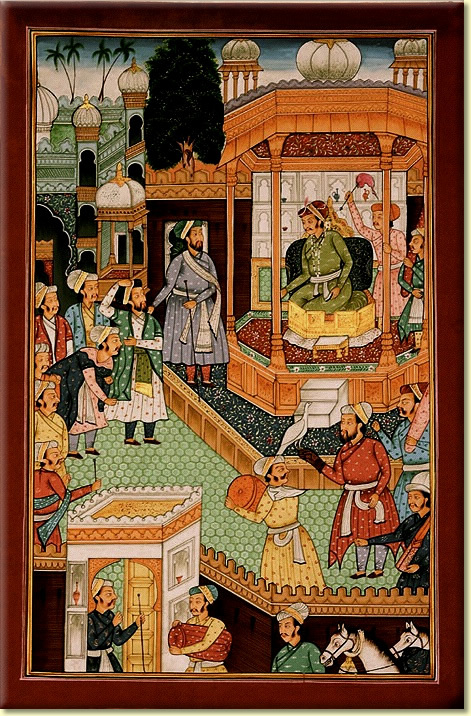 "Mughal court scene". © Exoticindiaart.com, used with permission.